All it takes is a quick survey of this year’s best Super Bowl ads to demonstrate the power of story. 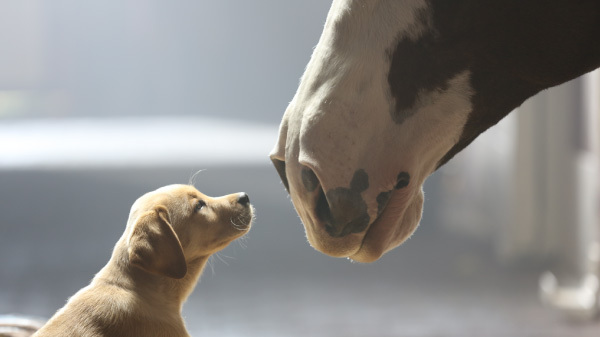 This year’s installment of Budweiser’s saga of the loves and losses of the company’s emblematic Clydesdales, “Puppy Love,” is a perfect example: The fuzzy pup who bonds with the big, beautiful horse in the “awww”-prompting nose-to-nose shot seems, for a heart-catching moment, destined to lose his friend forever. Clydesdales to the rescue, the buds are reunited, and the story ends with the satisfying sight of the two romping together in a wildflower-strewn pasture. Beginning, middle, tension-building climax, happy ending. We settle back in for the game with smiles on our faces, warm-fuzzies in our hearts. But what about the beer? In the case of Budweiser/Anheuser-Busch, which has done such a thorough job of branding the Clydesdales, it doesn’t matter that there was no beer in this story. We loved the story, and we love the story-teller, that beer company that always has the Clydesdales—yeah, that’s the one. The Olympics is another powerful marketing machine fueled by our innate human response to stories. Not a whole lot of Americans are avid fans of curling, luge or even downhill skiing. Yet millions of us, and millions all over the globe, are riveted to our TV sets night after night, as competitors fight their way to the medals podium in obscure sport after obscure sport. A large part of the appeal—and NBC does a masterful job with this—is the stories of the athletes: the Canadian skier who dedicates his race to his biggest fan, his brother who lives with cerebral palsy; the pairs figure skaters whose moms became best friends when the kids were scarcely in grade school and, now renowned as “the moms,” travel together to every international competition; the carrot-topped snowboarder who at age 27 is now considered the “grizzled old man” of his sport—will he keep up with the youngsters, or will he crash and burn? And the commercials aren’t bad either. Advertisers have long used the power of story to sell their wares. With the advent of interactive and ever-present media in our lives—Internet, smart phones, social networks—story is more important than ever in reaching an audience and giving them a reason to stay tuned. Not every business or organization is lucky enough to have a brand associated with horses and puppies. But every business or organization has their own stories to tell. It’s the rare business owner who has the time and energy to develop those stories and tell them in the most effective way, and that’s where we come in. Think about your company’s great stories, and how getting those stories out there can build your brand.